I’ve been reading a lot of young-adult fiction recently, and this delightfully charming novel might be the best of the bunch. 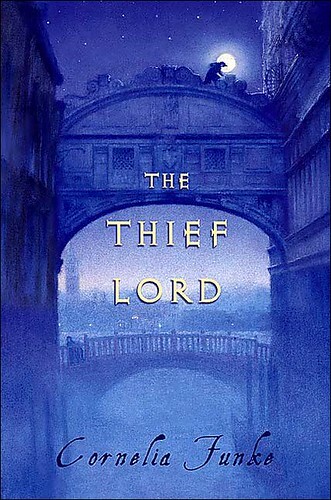 Originally written in German and released in 2002, The Thief Lord follows a group of runaways in Venice who are watched over by the mysterious and self-assured Scipio (the Thief Lord), a boy no older than themselves. Two of the gang members are brothers on the lam from their aunt, a mean women who wants to adopt Bo, the younger of the two boys, but send Prosper, the older, off packing to an orphanage. When the Thief Lord is offered a high-paying theft by an aged and wealthy Conte, the kids see it as their one-way ticket out of poverty. But the Conte isn’t what he seems. And the children soon find themselves in more danger than they bargained for. It’s a beautiful story. Adventure and mystery and family and loyalty with just a sprinkle of magic to boot. I was THRILLED after I read it to learn that a film based on the book was coming out on DVD in March. You can bet your picked pocket I’ll be the first in line to rent it. A.